The vision of self-driving trucks just came one step closer to becoming reality. Daimler has just conducted the first ever test of their semi-autonomous ‘Highway Pilot’ system in a production truck on a public road. Daimler tested a modified Mercedes-Benz Actros on Germany’s Authobahn 8. The truck still needed a crew to overlook it but could steer itself down the highway using a combination of radar, an array of stereo cameras and of course the ‘Highway Pilot’ system. This open road test of the production model truck shows that the technology could work on nearly any motor vehicle and it isn’t just a concept, as it will become a reality. Daimler had tested their concept vehicle in Nevada earlier in the year but this is the first test of a production model. It is still a long way off before we see fleets of self-driving trucks on the roads. Daimler had to get special permission for this test, and the current laws do not permit any kind of autonomous driving on the roads, let alone heavy goods vehicles. The system utilised by Daimler uses both a short-range radar (up to 230 feet) in a forward facing arc and a long-range radar (up to 820 feet) in a much smaller arc. There is also a stereo camera for detecting signs and road markings. 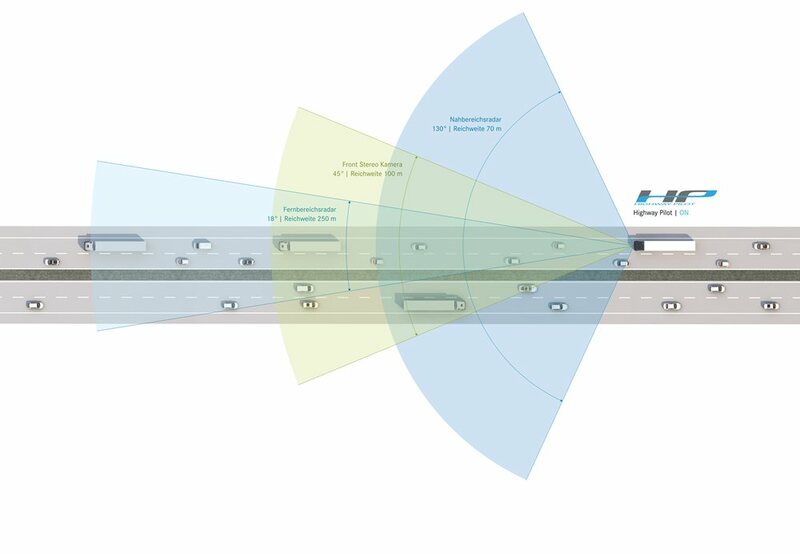 The ‘Highway Pilot’ system is only designed to control the truck while moving forward on the motorway so it doesn’t need to have all of the additional sensors that a fully driverless vehicle would have. As all of the sensors are onboard the truck doesn’t need an internet connection to remain autonomous. The Highway Pilot system is activated by pressing a blue button. If at any time the system detects driving conditions that it cannot handle, such as exits or delivery depots, it will alert the driver and if necessary stop the truck completely. Watching the road lane markers, the Highway Pilot keeps the truck within the correct lane, while having a virtual eye on the road ahead, it will slow the truck down with the flow of traffic and even apply hard braking, should another vehicle cut it off for example. Although self-driving on the motorway, the driver can retake control of the truck at any time. What does this mean for HGV drivers? There has been concerns raised that the introduction of ‘driverless’ trucks will result in the loss of jobs for HGV drivers, however this is not the case, well not at the moment anyway. The driver will still have a very important role to play within the vehicle and will be required to drive the truck in various situations such as exits, construction sites, delivery depots, surface streets and anything deemed unsuitable by the Highway Pilot system. What these trucks will bring is some potential downtime for the driver whilst on the long stretches of motorway. This downtime could be used to relax or even to complete other transport related tasks such as preparing documents, finding backloads or planning routes. In affect the introduction of self-driving motorway trucks should make a HGV drivers job easier and safer. 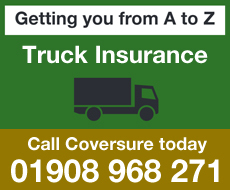 The haulage industry is driven by cost. Just as much as keeping their drivers and vehicles safe, on the road and on time, haulage operators will love the efficiencies that will be created by Highway pilot. Simply put computers are more efficient drivers than humans, so cost savings will be made as the trucks will be driven to optimize fuel efficiency. With the weight of the industry behind the technology it is likely that new legislation will be pushed through to allow autonomous vehicles in a matter of years. Daimler are not trying to position their autonomous trucks as a way to replace HGV drivers, but instead are highlighting the freedom it will give those drivers to relax while their trucks are on the long stretches of motorway. You can view their video to see how they refer to their system as an ‘independence day’ for HGV drivers. View the driving factors behind driverless trucks. What would you do with your time if the truck took over on the motorway?